Alone, adrift and in dire need of salvation. This is not a presumptuous and damning indictment on any reader of this piece, but the horrifying situation Robert Redford’s ‘Our Man’ finds himself in in this wonderful film from writer/director J.C. Chandor. A cursory glance at the short hand details might be off-putting; clocking in at 106 minutes, containing a single character and almost no dialogue whatsoever, it probably sounds like hard work. It is certainly a big risk for both director and star. However, Chandor (whose starkly contrasting previous feature was the talkie financial crash flick ‘Margin Call’ (2011)) has conjured a beautifully poetic and metaphorical rumination on life and our travails against both the tide and time, but with plenty of action to temper the pill. Faced with a ruptured hull on his boat and eventually a relentless battle against the cruel and volatile Indian Ocean, Redford stands tall in the face of his own mortality. He must gather his senses and fight for survival. If he fails, the cost will be his life. It really is a matter of life or death. 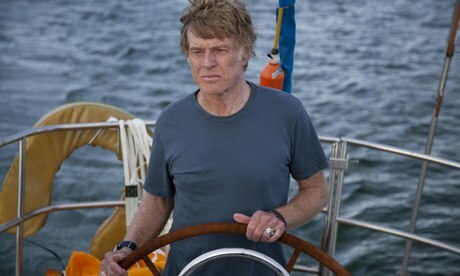 For ‘All is Lost’ to succeed as a feature, the performance must be substantial. It must be great. After all, Redford is in almost every frame. Thankfully, this icon of the silver screen has responded with a performance to rank amongst his career-best. He passionately translates every ounce of resilience and determination that his character commands. It is clearly imbued with the added heft of the audience’s knowledge that Redford himself, at the age of 77, is perhaps facing the twilight years of his own stay on this fair planet. You do not have to be Albert Einstein to translate the under-and-over-tones of this narrative. Whilst it plays out though, the protracted silence allows the mind to wander and wonder through his every decision and activity on screen; every implication and subtext. If there is no best actor nod at the Oscars for this display, then there is something very cruel and unjust at play indeed. He is towering and this is a gem of a feature. One of luminous power and lingering spiritual import. A poem for the soul that is also a nail biting action film. It could be seen as a sea-related companion piece to space adventure, ‘Gravity’ (2013), but with, and forgive me for this turn of phrase here, added gravity. If ‘Life of Pi’ (2012) moved you or pleased you in any way, ‘All is Lost’ will startle you the more and shake your senses with profundity. This entry was posted on 27/12/2013 by toomuchnoiseblog in Reviews and tagged Cinema, Film, gravity, Greg Wetherall, J.C. Chandor, life of pi, movie, Release, Review, robert redford.